ATLANTA (AP) — Political activist Leah McElrath was reviewing her electronic ballot at a polling place in Houston when she was shocked to find Republican Ted Cruz listed as her choice in Texas’ high-profile U.S. Senate race. McElrath had voted a straight ticket for Democrats, but the machine had switched her vote in the Senate race to Cruz, the incumbent. She snapped a quick photo, which she later posted on social media after seeing others making similar complaints. The vote changes in Texas are just one example in a long list of concerns about the voting process that have surfaced in the run-up to Tuesday’s election. 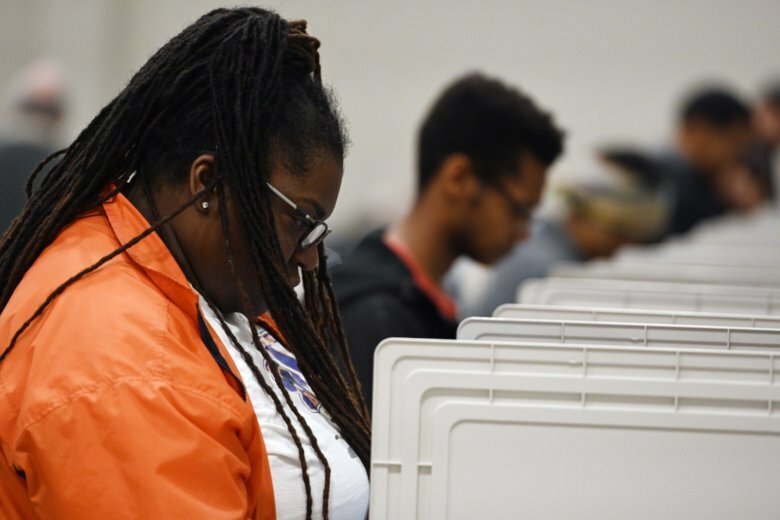 Outdated equipment, confusion among election workers, polling place closures and efforts in some states to make voting eligibility more rigorous are among the reasons for many of the complaints. Another factor: Early voting across the country has been heavier than during the previous midterm election, in 2014. The election also comes amid heightened concern over potential cyberattacks following Russian efforts in 2016 to target state election networks. There have been no indications so far of any significant problems revolving around election security, although state and federal officials say they remain vigilant. “With the highly anticipated midterm elections nearing, my colleagues and I have worked non-stop to secure election systems and protect our democracy,” Vermont Secretary of State Jim Condos, who serves as president of the National Association of Secretaries of State, said in a statement Friday. In California, Secretary of State Alex Padilla and Attorney General Xavier Becerra on Friday urged voters to make sure they know their rights, including the ability to cast a provisional ballot that can be counted later once a voter’s eligibility is determined. In the Texas example, the problem has affected both parties, with Cruz supporters also reporting their votes were switched. State officials said the problems can occur when voters complete and submit ballots too quickly. The vote-changing also is connected to a certain type of all-electronic voting machine that does not provide a paper trail, something voting experts say is a major concern because there is no way to verify later that an electronic ballot correctly captured the voter’s intent. Five states — Delaware, Georgia, Louisiana, New Jersey, and South Carolina —use such machines exclusively. A handful of voters in Guilford County, North Carolina, have reported problems similar to those in Texas. County officials there have attributed the issue to old technology and been encouraging voters to double check their choices before submitting their ballots. In Georgia, civil rights groups have filed several lawsuits over voter access in the weeks leading up to the election as Republican Brian Kemp and Democrat Stacey Abrams face off in a close contest for governor. The groups say Kemp, who oversees elections as secretary of state, has been too aggressive in removing people from the voter rolls and implementing the state’s “exact match” law, which flagged some 53,000 voter registration applications. They say the policy disproportionately affects black, Latino and Asian-American applicants. The law requires information on the forms to match certain state and federal records. Kemp has said the concerns are overblown because those on the list can still vote if they bring a valid photo ID that substantially matches the information on file, something already required under the state’s voter ID law. Also in Georgia, a high rate of absentee ballots rejected by election officials in a suburban Atlanta county triggered lawsuits by the ACLU and other groups. They said voters are not being given enough time to fix problems with their ballots. A judge ruled that voters should have until the Monday after the election, when results are certified, to verify their ballot when it’s been flagged for a mismatched signature. In Kansas, groups are raising alarm about physical access to polling places. Voters in Dodge City will have to travel outside the city limits to visit their polling place on Tuesday. Election officials moved the city’s lone polling place, citing construction at the previous site. Concerns of voter confusion stemming from last-minute court rulings have arisen in a handful of states, while fliers with inaccurate information about deadlines for absentee ballots have circulated in Missouri and Montana. The good government group Common Cause is monitoring voting concerns around the country. Its president, Karen Hobert Flynn, said most of the problems reported to date are fairly typical. “We are waiting to see what else will come out,” she said. Hartounian reported from Phoenix. Associated Press writer Will Weissert in Austin, Texas, contributed to this report.